As a beer writer I sometimes get asked to do reviews. The inherent conflict is that I am getting free samples of something I enjoy a great deal, so some bias assuredly must creep in. On the other hand, knowing that I likely have some inherent bias I could veer in the opposite direction and become overly critical so as not to give the perception of bias. This is where the BJCP (Beer Judge Certification Program) guidelines come in handy. For those unfamiliar with this source of beer evaluation it is essentially the definitive (by American standards) of most of the publicly recognized beer styles and their defining characteristics. It is not an indication of whether a beer is intrinsically bad or good. Think of competitions that are governed by the BJCP (i.e. most beer competitions) as dog shows. Is the winning dog any better or more of a companion than the scruffy mutt at your side? Of course not. It is a set of parameters that the average dog of that particular breed falls into. The most beagle of all the beagles. 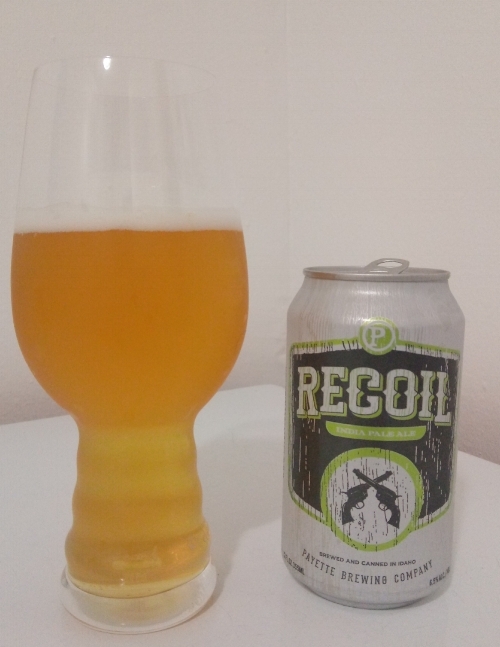 So with that, my first review: Payette Brewing Co.
Payette Brewing Co. is currently expanding its distribution to Denver, CO, my former home for four years, and will be offering their beers in cans. I personally love cans as they are superior in retaining flavor and are infinitely recyclable. And for the one drawback that I hear from people that it "tastes metallic when I drink it from a can", 1) all beer cans now contain a liner so the beer never comes in contact with metal and 2) that's because your mouth is touching the can... so grow up and pour it into a glass. Fresh hop aromas of resiny pine and some tropical fruit. A hint of crackery malt, with no apparent flaws. Dark yellow with a small white head and slight chill haze but relatively clear. Hop dominated flavor, but not overly bitter. About average bitterness for an IPA without being aggressive. Nice mix of old-school American piney hops and some more modern fruit-forward flavors. Moderately low mouthfeel that isn't filling, but also not light. Finishes fairly dry with a moderately high carbonation that enhances the hop bite as well as aids in drinkability. Overall a pretty straight-forward and classic version of an IPA. This isn't the best or most inventive IPA I've ever had, but I'd also say it would easily become a nice standby if I wanted something familiar. A big, juicy burger with a highly flavorful cheese like gorgonzola is begging to be devoured with this beer. As I write this it's nearly gone, a testament to its drinkability and nuances that beg to be discovered. A dark orange color, quite hazy and almost opaque, with very little head retention. Big citrus aromas up front that continue throughout. No malt aromas and no off-aromas either. Orangey citrus continues into the flavor with very little bitterness except on the back-end. Bitterness comes in the form of a orange pith-like astringency. Medium to low body, but some creaminess. Moderate carbonation. Some residual sweetness, but still fairly crisp. Kind of a one-note pale ale (that being a very big C note for citrus), that blends the lines between an American Pale Ale and the newer New England IPA styles. It's quite easy to drink and would be an enjoyable accompaniment to smokey BBQ that isn't overly sweet. This doesn't have the cloying, sticky sweetness of some poorer examples of the NEIPA, but also lacks the complexity of the best examples. For a pale ale it also lacks some of the maltiness you look for (some toast, breadiness or a hint of caramel). So although this may not be your classic pale ale, it by no means is a bad beer. In fact, if you're looking for something that won't get in the way of a really flavorful dish, or you're trying to introduce craft beer to a friend, this is a great beer to gravitate towards. Bright yellow in color with very light haze and a foamy white head that dissipates quickly. Not much in the way of malt aroma, but an initial waft of herbal hops comes off the glass when first poured. Fairly full-bodied for a pale lager, but that probably adds to the toasted cracker and doughy bread notes. Still quite crisp with moderate carbonation. No real perceptible hop flavors. I grabbed this one out of the fridge after taking the dog for a walk on a 94 degree day, hoping it would quench my thirst. It is a thirst-quenching beer, but don't expect to be able to have more than a few pints of North Fork. It has some nice malt-derived flavors, but does drink a little bit heavy for this style. That being said, if you're looking for a beer as a compliment to some backyard fare this is a great choice. Even though you aren't going to be able to plow through that six pack, it's going to go great with heavy cook-out foods like burgers and brats. A little bit more bitterness would help cut through those fats, but if you want something clean that you can drink with just about anything grab a couple six packs for a summer BBQ. It will be an easy drinker with whatever your guests or friends bring to the next potluck.